Ryan Porteous had to go off with a knee injury at Fir Park. Here are three Hibs-related observations from Fir Park. Hibs were widely acclaimed for an impressive display against League Two side Elgin City at the weekend, but this chastening defeat served as something of a reality check. The sparkling attacking play from the weekend was almost non-existent in Lanarkshire. While much of this was down to Motherwell’s impressive performance, Hibs were generally flat and, aside from a few sporadic Ryan Gauld moments, lacked invention in attack. The optimism which had started returning to Easter Road over the past fortnight drifted away in the Lanarkshire cold as jeers rained down from a disgruntled away support at full-time. There is still much work to be done to get Hibs motoring back towards the top six. 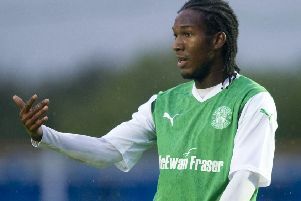 On paper, the Hibs team Neil Lennon started with looked full of creativity and potential goal threat, with the likes of Daryl Horgan, Ryan Gauld and Stephane Omeonga charged with supplying and getting forward in support of lone striker Florian Kamberi. In reality, it simply didn’t work. Motherwell’s midfield smothered their Hibs counterparts and cut off the service to Kamberi, who was forced to feed off scraps. On one of the rare occasions, in the first half, Hibs got the ball into their main striker’s feet, he played a sharp lay-off out to the left channel but was left exasperated when no-one ran on to his clever pass. He was less isolated after the break as Hibs’ play improved slightly, but even then there was a lack of quality delivery for the Swiss hitman to feed off. For much of the first half of the season, Ryan Porteous and Efe Ambrose were Hibs’ most reliable centre-backs as fitness issues plagued Darren McGregor and Paul Hanlon. Now Ambrose has left the club and Porteous is facing the prospect of an extended lay-off after his knee popped out its socket again at Fir Park. Midfielder Mark Milligan can fill in at centre-back if required but a pool of centre-backs which looked strong just a few weeks ago suddenly looks threadbare at a time when the team desperately needs a solid base to build from. If he wasn’t already, Neil Lennon will surely now be looking at the possibility of adding a new centre-back this month.